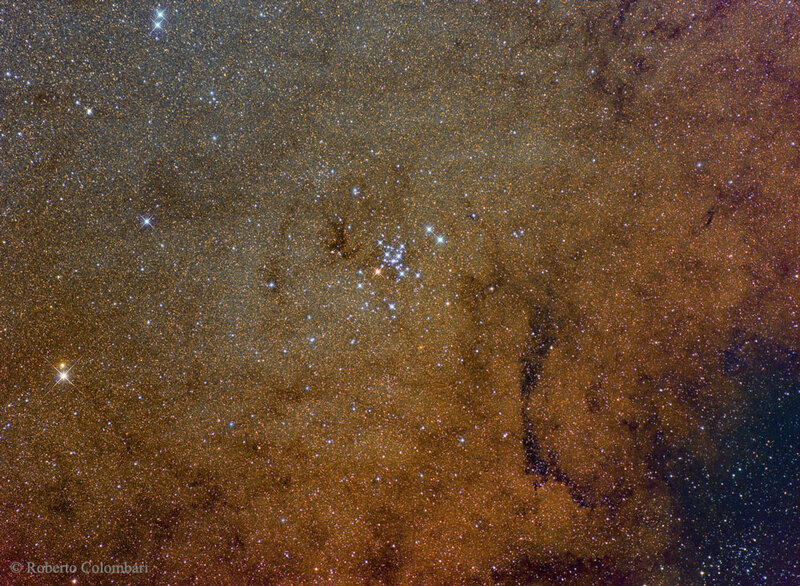 What you see is the so-called M7 or, also known as NGC 6475. It is a cluster of stars in the constellation of Scorpio whose greatest interest is that, apart from being observable to the naked eye, they have a bluish color. There is a total of about 100 stars covering about 2 degrees to about 1100 light years away from Earth occupying about 30 light years across. The age of the cluster is about 200 million years. The blue color is due to the fact that, these stars, have a great abundance of helium above the hydrogen and is surrounded by cosmic dust that reflects, in reddish color, the light coming from the stars. It is one of the “oldest” clusters since there are references to it since 130 after Christ by Ptolemy, astronomer, mathematician and Greek-Egyptian philosopher although it was not until the Meisser catalog (hence its name M7) created by Charles Meisser, a French astronomer who cataloged 110 groups of objects in the seventeenth century.